I had a request for some last minute Christmas cards so I quickly put together 2 cards made with pre-cut elements from my cherished "doo-dad" box. If I cut something and don't use it, it goes into that box for a future make. 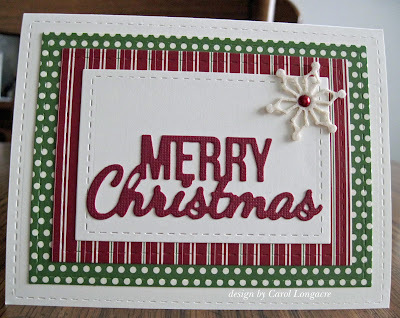 This card makes use of the KaiserCraft die-cut Merry Christmas sentiment along with a red striped die-cut panel done with retired SU! dsp and Lil Inker stitched rectangles. All I had to so was die cut a larger rectangle from some coordinating dsp, a smaller rectangle from vanilla cardstock, and add a cream-colored felt snowflake with a shiny red brad. This card makes use of my last known piece of Basic Grey Jovial dsp from that favorite retired paper pad. I didn't know what to do with all those busy and cute little snowmen, but seeing them peeking out from behind the dark green panel is pleasing to my eye. The card was made with more snippets from my doo-dad box and some vanilla cardstock as well. My Lil Inker stitched rectangle dies came to the rescue again for these quick and easy last-minute cards! How did I ever live without these dies I wonder? I'm sharing these with the Tuesday Throwdown #323 anything goes challenge. 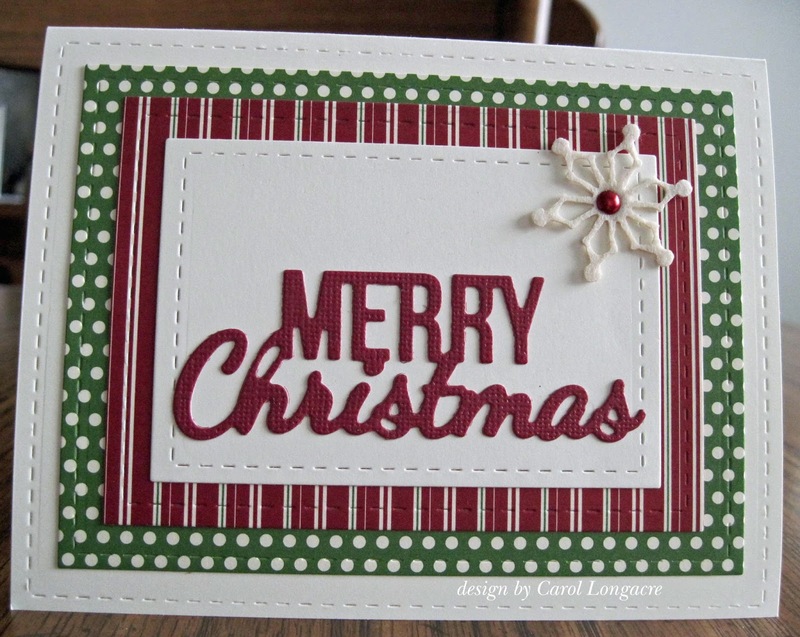 Both cards are festive and jolly! I like the idea of your doo dad box, I keep a pile of stuff, but a box would be neater and keep them more intact (I sometimes get thing bent in the pile). Great ideas for storage and your cards! Two fabulous cards Carol, they don't look quick - lovely traditional colours. Two great last minute cards. I love the felt snow flakes. Sometimes I imagine your doo dad box as being a small little box and other times the size of a 55-gallon drum (what I'd need). Whichever it is you have the greatest bits and pieces in it. These are great quickie card. 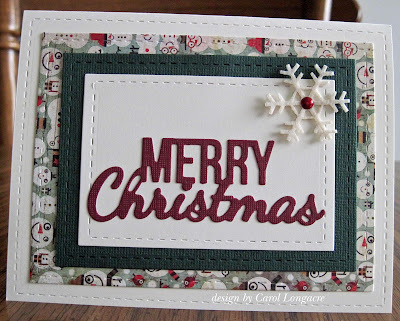 I really like the die cut greeting with the mix of print and cursive. It could go either way, whimsy or serious. Very nice! Both cards are very Christmassy and lovely, love the papers.